Corrugated bins are used in warehouses for stocking different SKUs under one roof in organized manner. Mostly used by ecommers, wholesler & logistic companies. Note : We don't deal in plastic/poly boxes. Corrugated Bin box is used for storage of items on small standard shelves. Self-locking, you need no glue or tape to set these boxes up available in brown and white color with standard quality with wide range. Minimum 500 to 1000 Qty. Being a well-established organization, we are engaged in offering a distinguished range of Corrugated Bins. Being a leading firm in this industry, we are deeply engaged in offering a high-quality range of Corrugated Bin Box. 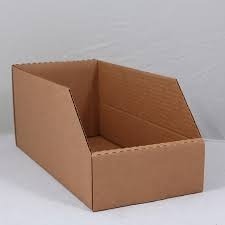 We offer superior quality of Corrugated Bin Boxes for bulk packaging purposes. These Corrugated Bin Boxes are custom-made these Corrugated Bin Boxes to suit customer specifications. We deals in corrugated bin boxes and standard corrugated bin boxes. All boxes are standard 200. Regular Slotted Carton. All sizes ship flat for easy storage. 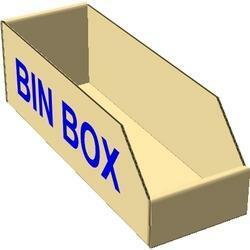 . . We are supplier of standard corrugated bin boxes in Delhi, India.